Mt. Rushmore is a tribute to four great Presidents—George Washington, Thomas Jefferson, Theodore Roosevelt, and Abraham Lincoln. Ask students: Which four Presidents do you think deserve a monument like Mt. Rushmore? Then have them write a paragraph, persuading President Bush to have it built. Have your students match the President to the coin that shows his face. Have students color a picture of a President and then write a short description of that President. Have students write a letter to President Bush. Take students on an Abraham Lincoln treasure hunt. Lincoln grew up in extreme poverty and lived in a primitive log cabin. Have students re-create a log cabin. A great way to show students a link to the past is to have them interview an adult—a teacher, a parent, or other relative—and compile a list of the Presidents who served during that adult's lifetime. Students can ask the adult to describe an important memory about each President. Have students take a tour of Abraham Lincoln's home, from the kitchen to Willie and Tad's bedroom. Students can explore all three floors of Washington's beloved home, Mount Vernon, on a tour of the historic Virginia mansion. One of these Georges is not like the other. See if your students can find the two portraits that match. Students can try to identify some Presidents by looking at their pictures. Test students' knowledge about Presidents. Have each student create a unique flag to honor a favorite President. Students can draw or paste an image of the chosen President in the area where the stars would normally go. Suggest that students add (anywhere on the flag) a number of stars equal to the number of the President (e.g., Washington is one star, Adams is two stars, etc.). Students can then write an important fact about the President on each stripe. The President's home is, of course, the White House, but how many of your students have actually been inside? Have them take a quick, interactive tour of the White House, narrated by Spotty, President Bush's English Springer Spaniel. Have your students match the President to the bill that shows his face. Now what? Have students find out what it's like to be President. What can a President do when his son's goat gets loose in the White House or when his son wants a turkey for a pet? Have students read these stories to find out. Have students try to match a quote with a specific Presidential child. According to a 19th-century newspaper, this cake was one of George Washington's favorites. That makes it a perfect treat for your students to make in honor of his birthday. Have students search for names of Presidents hidden in a puzzle. From Abraham Lincoln's first day in the White House, he faced the irreconcilable conflict between slavery and abolition. Bring students back to this time period to view slaves' living quarters. Have students watch an animated growth chart of the United States, from President Washington's time to 1907. Where in the Country Are the Presidents? One way we keep the memory of our Presidents alive is by naming places after them. Have students find such places anywhere in their state or country. States take great pride in the claim that one of their residents reached the White House, and a candidate's home state plays a big role in calculating his or her chances of winning the Presidency. Do your students know which state can claim the most Presidents over the years? Have them find out with this graphing activity. 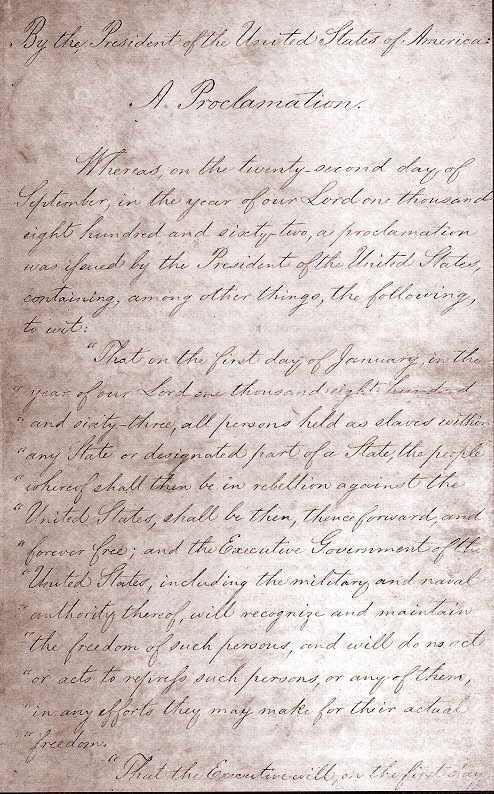 Have students read the first page of Lincoln's handwritten Emancipation Proclamation, issued January 1, 1863. Lead a general discussion about freedom. Then ask students to list specific freedoms they have in their home, school, and community. Next, brainstorm a list of freedoms denied to slaves. Have students write a short personal response to the proclamation from a slave's point of view. Pose a question of interest to your students, such as “Should we have a class president?” or “Should we have a school mascot?” Then explain that politicians often take polls to determine public opinion before making key decisions on issues. Take a class poll to determine everyone's position on the selected question. Discuss any surprises that may result from the poll and what would make students change their minds in a follow-up poll. Test students' knowledge about Presidential facts. Students will read Sections 1–4 of Article II of the United States Constitution, learn more about powers granted to the President of the United States, and write a “Help Wanted” advertisement for the job. The Presidential seal comprises many symbols. Have students find out what they mean. Students can also create a new Presidential seal. How much does the President earn an hour? Have students use the information below to figure his hourly rate of pay, before taxes. How familiar are your students with U.S. Presidents? Have them see how few clues they need to recognize our nation's leaders. We honor our Presidents in many ways, from casting their images on coins to naming places and monuments after them. Challenge students to find the obvious and not so obvious places where Presidents' names and images appear. Ask students to cite their sources. Have students read some of Lincoln's most famous speeches. Have students test their Presidential recall with an online game of hangman. Can your students match the Presidents to their nicknames? This lesson addresses George Washington's leadership in forging a new government for the United States after the break from England in 1776. The lesson uses Washington's own words to illustrate the events leading to the establishment of our national government, and the crucial roles he played throughout that process. Have students design a mock Web page for their favorite President. Features might include sound clips, photographs, current events of the time, family news, and fun facts.